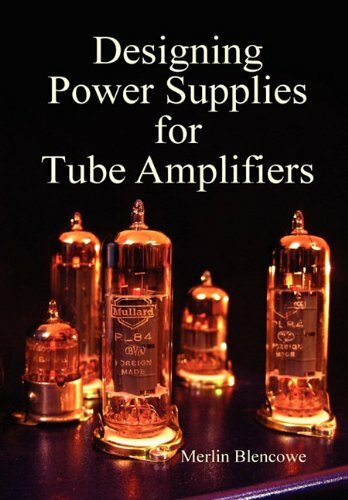 While browsing the Valve Wizard website I discovered that Merlin Blencowe had written and self-published two books called “Designing Tube Preamps for Guitar and Bass” and “Designing Power Supplies for Tube Amplifiers”. I have long been a fan of Merlin’s clear and informative style of presentation so I decided to buy both and I’m glad I did. From my experience it is unusual to find as much useful information in a modern book on Valve/Tube Electronics. 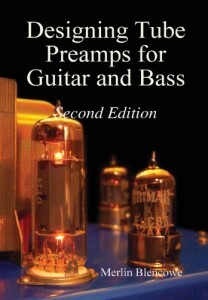 I have only had time to read sections of the book about Preamps so far but Kevin O’Connor’s “The Ultimate Tone” is the only other book I have read which has provided so much food for thought. Merlin’s books explain the fundamentals of circuit design so do not make for easy reading but Merlin takes a practical approach which makes the subject easier to digest. I bought both books from Amazon in the UK. Both books are still available despite Merlin’s warning that the volume on Power Supplies is now out of print. At just over £40 including postage for both books, I think they offer exceptional value for money. 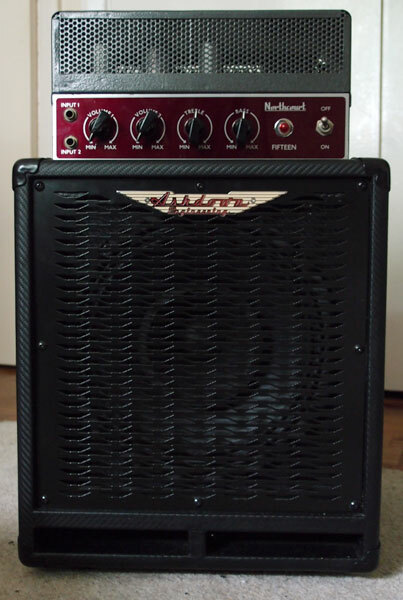 Today’s Class D amps and improved speaker technology make bass rigs ever smaller, lighter and cheaper which is a good thing for the gigging bass players among us. I don’t think there can be any argument about this but I’m not a gigging bass player – I’m a guitar player who plays the bass for fun – so I’m more interested in tone, size and power output. I want my bass rig to sound good at a sensible sound-level and to be small enough to fit into a home environment. I have an old Park (by Marshall) practice amp but the sound quality is pretty dreadful and dialing in a decent tone is almost impossible. If I play the bass through a simple headphone amp, leaving the tone-controls flat, the sound quality is hugely improved but I don’t like using headphones. 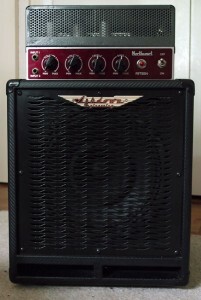 So I need a new rig and that’s it in the picture; an old valve amp sitting atop an Ashdown Mi10. I love the size of the mi10 cabinet; the rig doesn’t even reach my knee. It probably isn’t a very efficient speaker but, in this application, it doesn’t really need to be. 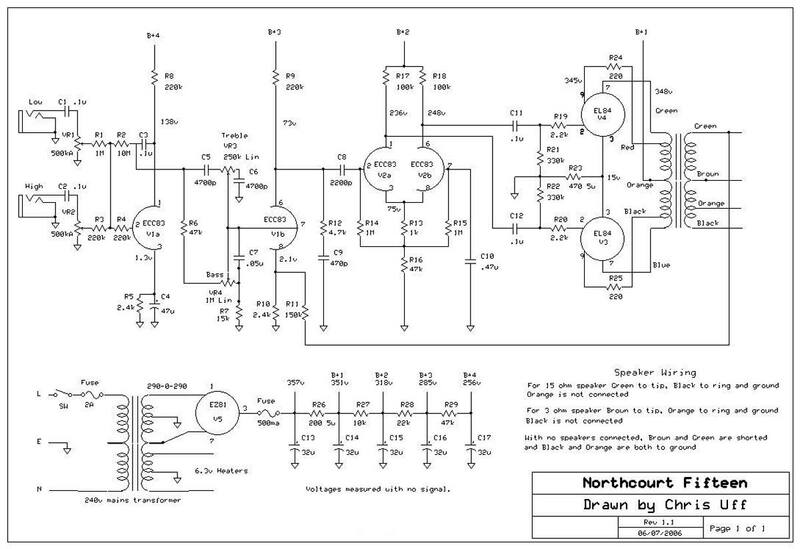 A lesser-known part of the story of British amplifier manufacture in the sixties, Northcourt specialised in affordable “cage” amplifiers for guitar and bass. They were closely related to R.S.C and Linear, who sold similar amplifiers to be used for music playback and P.A applications. Like their ‘Hi-Fi’ cousins, Northcourt designed their amplifiers to be used in “ultra-linear” mode, which resulted in very clear, transparent amplifiers with a low degree of distortion. Due to their linear nature, Northcourt amps never really reached the output levels suggested by their names. 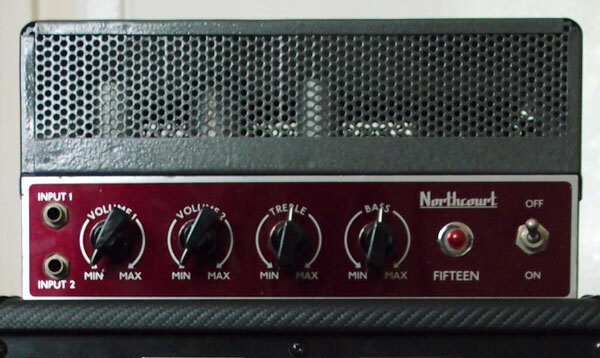 The Northcourt 15 was realistically somewhere between 10 and 12 watts before clipping. Looking at a schematic I found on the web confirms the ultra-linear design. This approach is more common in hi-fi amps than in guitar amps but I think it would be very suitable for a bass and 10 watts of output will be quite enough for my needs. The output transformer has a 3Ω tap and the Ashdown Mi10 is a 4Ω speaker so there are no problems there. The tone-stack is closer to a Baxandall tone-stack than the usual guitar tone-stack but it’s not one thing or the other. The input is also peculiar, having a volume control for each input placed before the first valve. My immediate thoughts are to use the two inputs for active and passive pickups and use one volume control to govern pre-amp gain and the other as a master volume to control the input to the power stage. The reservoir capacitors seem rather large for the pre-amp valves where only a milliamp or so is pulled so I am not sure whether I should try reconditioning the can capacitor or replace it with more sensible values. 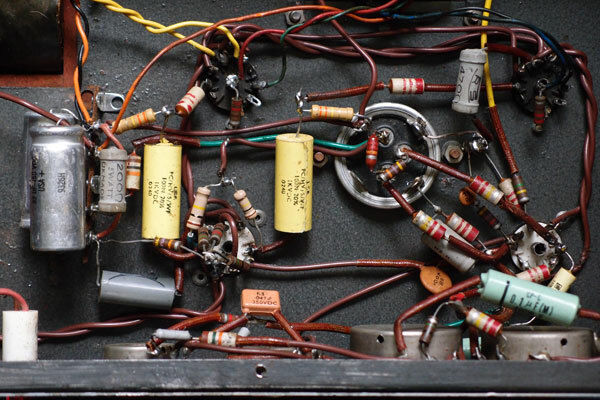 Looking at the inside of the amp reveals a lot of old carbon resistors and some ceramic capacitors that should probably be replaced. The paper-insulated transformers appear to be intact. It may be that the output transformer is a little small for bass but I don’t have a five-string and the feedback loop should compensate to some extent. The next step will be to sketch out some ideas for the new schematic. I won’t get it right first time – I never do – so please feel free to share any thoughts on you have on this project. Hopefully this will give you a flavour of the content to come. I started working on guitar valve/tube amplifiers a little over ten years ago. I haven’t had much chance to work on them recently but here are two that I have designed and built some time ago. To combat the his produced by the EF86s I’m going to try some Sylvania military-grade EF86s. I’ll update the sound-clips when they arrive. The singing isn’t great but I do like the sound of the guitars. The next project is going to be a small valve bass amp. I’ll post more information soon.